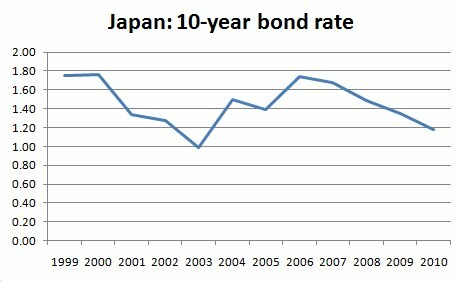 Normally I try to keep this blog focused on explaining economic issues and concepts. But in the past few days there’s a political issue has arisen that’s literally very close to home for me and I feel the need to speak out. Last week, Terry Jones and his assistant Warren Sapp of Dove World Outreach Center in Gainesville, Florida came to Dearborn, Michigan with the announced intent to protest at the Islamic Center of America, a very large mosque in Dearborn. Jones and Sapp are the characters who threatened to hold a bonfire burning hundreds of copies of the Koran last September, igniting worldwide protests. The burning last September was cancelled after the Gainesville, FL fire department refused a burning permit. At the time Jones and Sapp bowed to pressure and said they promised not to publicly burn the Koran. They lied. In March 2011, they held a public “trial” of book and then publicly burned a copy. Jones and Sapp also announced last month that they would come to Dearborn on April 22, 2011 to protest the “spread of sharia law” in Dearborn. They stated they would come to the Islamic Center of America in Dearborn and burn a Koran. On the day of the scheduled “protest” Jones and Sapp found themselves in court in Dearborn with the prosecutor asking the court for Jones and Sapp to post a “peace bond”. Following a hearing before a jury, the judge ordered a $1 peace bond and ordered Jones and Sapp to stay away from the mosque for 3 years. The national media has greatly misreported both the facts and the issues in this case. The case is close to home for me because I live in Dearborn. The media have been reporting that this is a pure free speech case and that the prosecutor was trying to keep Jones from protesting or keep Jones from saying his message. That is simply not the case. Let me repeat some facts that commentators not familiar with Dearborn don’t tell you. First, to understand the need for the peace bond or restraining order, it’s necessary to know a little about the physical geography of the site. Here’s a link to a satellite view Google map of the location where Jones had planned to protest. Please note, there’s no public property available for assembling a protest at the site. To hold his planned protest, Jones was threatening to trespass on private property, the mosque itself. There is no first amendment right to free speech on other people’s private property! The only alternative for Jones would have been to block traffic on Altar Road. Altar Road is a dead-end street with only access at one end. There is no free speech right to block traffic on a public street without at least getting a city parade permit first, which Jones did not do. In fact, if Jones had implemented his planned protest on the public roadway of Altar Road, he would have blocked access to not only the mosque, but to the five other churches (all Christian) that are located on Altar Road next to the mosque. For all those who claim Jones has a first amendment right to protest and block Altar Road, I ask how does Jones’ first amendment rights trump the first amendment rights of the members of the other churches to worship? Keep in mind that Jones was threatening to either trespass the mosque or block traffic on Good Friday when those other churches were holding services. To claim that Jones should have been allowed to hold his protest is to claim that Jones has the right to prevent hundreds, perhaps thousands, of Dearborn residents, both Christian and Muslim, the right to worship as they see fit. So it’s not a clear-cut case of freedom of speech as the media would have us believe. There’s also issues of private property and freedom of worship (another first amendment right). But the city also had legitimate concerns for public safety. The city’s concerns for public safety aren’t with the prospect of some crazed Dearborn Muslims rioting in the street over Jones’s presence or the burning of a Koran. Our community is too peaceful for that. Indeed, the Mosque was planning alternative peaceful activities to take attention away from Jones. No, the threat comes from Jones himself and from the crazed outsiders he would attract. It was only 3 months ago that we in Dearborn were fortunate to narrowly escape a plot to bomb this very same mosque. A crazed man from California attempted to take a car loaded with explosives and blow up the mosque. The attempt was only stopped by a quick police response to a tip from an alert Dearborn bartender. We have recent experience with hate-crazed people coming from out-of-town and trying to blow up the mosque! Forgive us if we have concerns about another dangerous hate-crazed man from out-of-town bringing guns and/or explosives. Make no mistake, Jones is a direct threat to public safety. On the night before the planned protest, Jones recklessly discharged a firearm in public. After attending a new interview at TV station on Thursday evening, Jones got in his car and discharged his .40 caliber pistol. Jones has a concealed carry weapon permit from Florida. Under reciprocity rules, Michigan recognizes such a permit. But a concealed carry weapon permit is not a license to discharge the firearm at any time or to not keep the weapon under control. When approached by police, Jones claimed it was an “accident”. Either Jones intended to do something else with the gun and lied when confronted by police, or Jones is an idiot who doesn’t keep the safety on his gun and doesn’t have control of it. This guy was further threatening to trespass at a church (the mosque) the next day. In Michigan, possession of guns is illegal on church property, even with a concealed carry permit. Contrary to what Jones and his apologists in the media claim, Jones has not been stopped from protesting in Dearborn. In fact, the Mayor actually welcomed him and asked him to do his protest on public property in front of city hall. What Jones has encountered is a peace bond. It’s like a restraining order. The essence of the order is that Jones not trespass on the mosque property for three years. That’s it. He’s free to return and protest to his heart’s delight. But he has to do it on public property. He is not entitled to trespass on private property to spew hatred at the owners of the property. He is not free to keep others from worshiping at the church of their choice. He is not free to threaten the safety of others by violating our gun laws. I take a back set to no one in my support for free speech and Constitution’s bill of rights. But this isn’t a case of government trying to restrain political speech of crazy hate-filled man (see also here). It’s a case of government trying to protect the rights of thousands of citizens to worship as they see fit and to be safe and secure on their own private property. I know that doesn’t fit the media’s preferred drama, but that’s the facts. I’ve commented on this before, but it’s worth repeating. Millionaires, despite all their bluster and threats to move when taxes are raised, simply don’t move. It’s empty threats. If income tax rates are raised on millionaires, they actually stay put. This means it is indeed possible to improve state government finances by using a very mildly progressive income tax, a tax with a higher rate for very high incomes. The evidence comes from academic studies of a near-perfect test case: New Jersey. When anyone brings up new taxes on the rich, the big objections is that such taxes end up being counterproductive because the rich simply flee to places that don’t tax them. This is, in theory, particularly true at the state level. It just doesn’t appear to be true in practice. The study dug deeper to figure out whether the millionaires who were moving out did so because of the tax. As a control group, they used New Jersey residents who earned $200,000 to $500,000 — in other words, high-earners who weren’t subject to the tax. They found that the rate of out-migration among millionaires was in line with and rate of out-migration of submillionaires. The tax rate, they concluded, had no measurable impact. The study went on to conclude that “the policy effect is close to zero,” though if it exists for anyone, it’s for the over-65 crowd who live off their investments. Just What Is Inflation? Is A Monster Just Around The Corner? A casual reader/listener of many economics blogs, news stories, cable shows, and political speeches (in other words, the usual sources), would be forgiven for thinking that “inflation” is some awful comic-book super-villain that constantly threatens society. It’s as if they think that any momentary lapse in vigilance that allows perhaps a declining unemployment rate will bring the villain back to life. And worse, if we aren’t careful, they warn, the Inflation will morph dramatically into Hyperinflation, kind of like making the Incredible Hulk angry. So even though the economy is struggling with millions of unemployed and underemployed people, we seem obsessed with the fight against Inflation. Nevermind that inflation doesn’t harm us as much as unemployment, it’s what the powers-that-be fear now. And recently as food prices rose during the winter and gas prices have recently risen back to the $4.00 per gallon range, we’re being told it’s coming! Inflation. Now before we hide the women, children and checkbook in fear, let’s stop and think about it. Let’s start with Just what is inflation? Many people assume that inflation is rising prices. It’s not. Rising prices are one of several signs that the economy might be experiencing inflation, but the fact that some prices go up is not inflation. 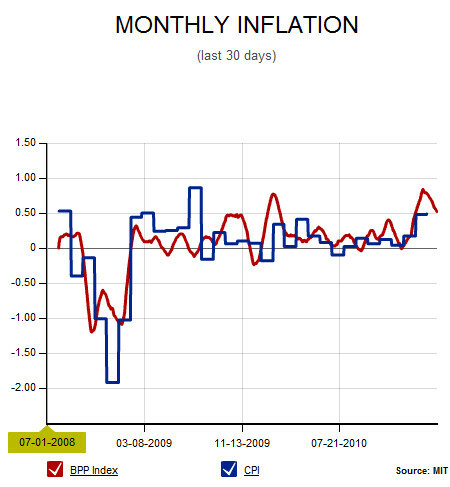 Inflation is a continuing, ongoing rise in all prices in the economy. If you think of it this way, phrases that we read/hear like “food price inflation” or “gas price inflation” are just absurd, nonsense phrases that don’t mean anything. It’s like saying “specific generality” or describing something as being “uniquely universal”. If the price of only one group of specific commodities or goods are going up, then it’s not inflation. If the prices of all goods and commodities are going up, then it’s inflation. So the fact that gas prices are going up or that food prices might have gone up means that buyers of those goods, which is most folks, are having to adjust their spending. Those items are getting more expensive relative to other items. In micro-economic terms, they are getting scarcer relative to the demand for them. That’s an uncomfortable place to be if you need those products. If you can’t cut back your consumption, if means you experience a real decline in your living standard. But it doesn’t mean the economy is experiencing inflation. You cannot look at the price of one or two specific types of goods and conclude that inflation exists. Period. You have to look at all prices across the economy. You have see that prices are rising for nearly everything that gets purchased. This inflation-means-rising-prices-across-the-entire-economy aspect means we have to look at a very large number of goods prices, not just gas or food or gold. But it also means more than goods prices going up. All prices must be rising. That means wages (price of labor), prices of financial assets, and prices of non-financial assets (things like real estate, collectibles, etc). When we consider these other prices, we see that despite what we’re paying at the local Exxon station, inflation is conspicuously absent. Wages are not increasing. According to Data360, reporting government BLS data, the average hourly wage for good producing workers rose from $20.55 to $20.59 in first quarter 2011. That’s less than 0.2%. 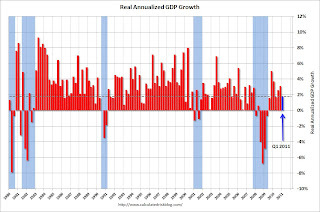 On an annualized basis, it’s less than 0.8%. No inflation in there. Service-producing workers are worse off. The average wage is falling from $19.05 to $19.02. Their wages actually declined! Overall, no inflation in wages. But what about non-financial asset prices? 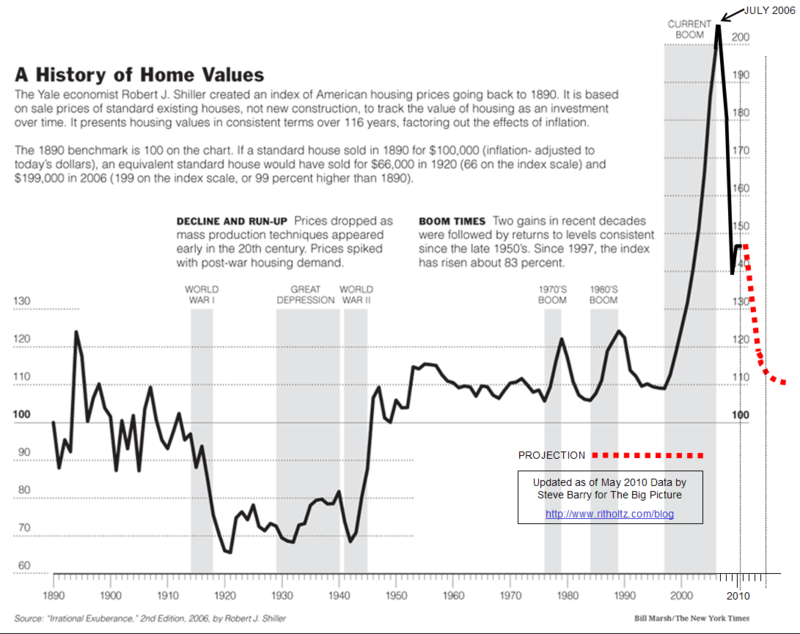 Well the latest data on home prices also shows declining prices, not increases. CalculatedRisk Blog reports on the March Case-Shiller house price index and reports a declines in recent months. No inflation in non-financial assets. Notice the scale. Prices of a wide selection of goods are rising at a less than 1% rate. That’s not really inflation folks. So despite the prices in the groceries (which may be easing in coming months – they’re driven by weather issues) and the price at the pump, inflation is not a problem. But there’s another aspect to our definition of inflation that’s very important. That’s the use of the word continuous or continuing rises in prices. If prices go up once or go up for a couple months and then stop rising, it’s not really inflation. Inflation is when all the price rises begin to feed off of each other. Most goods go up in price, so workers demand and get a rise in wages. The wages go up and firm owners want their profits to go up too, so they raise the goods prices, driving even more demands for wage increases. A spiral develops. It’s called a wage-price spiral. Everybody begins to expect inflation, rising prices and wages and so they start basing plans on assumptions of future rising prices, further increasing their present demands. That’s how inflation works. That’s what happened in the U.S. and many developed countries in the period of the late 1960’s through the early 1980’s. It is not happening now. A major reason why it can’t happen now is that workers don’t have any bargaining power to make demands for wage increases. Union membership is very, very low by historical standards. When unemployment is at 9% and has been for nearly 3 years, there’s no bargaining power for workers. Yes, we are experiencing higher gas prices today. Gas prices may well continue to rise for months yet. We have also experienced some higher prices for food, although the future trend is not clear. Yes, gas prices are a component of many other product prices since transportation is critical to any physical product. But what we are not experiencing is inflation. We are experiencing, in econ-talk, rising relative prices for gas, oil, and food. To the extent that these goods are essential and we must continue to buy the same quantities of them, it means something else must give. Our standard of living will decline. But it’s not inflation. We could call it workers-get-screwed-againism, but it’s not inflation. Why does it matter what we call it? It matters because the usual sources want to call it inflation so they have a political cover to do things they otherwise couldn’t do. They want to cut government budgets and spending. Some of them (bankers and big investors) would actually benefit economically from mild deflation. They can’t get a hearing that way, so they call it “inflation” and they raise up the threat of a monster. But it’s only a comic-book fake monster. It’s not real. Not now. After the More button is information from ReMapping Debate on how you can download (unfortunately Windows-only) a tool that let’s you analyze and compare tax rates and taxes paid for any type of filer between 1945 and 2010. For example, you can see if a married filing jointly household with $75,000 in income would have paid more now vs any other year back to 1945. Interesting tool.